Roaming Through Romans: A Bible Scavenger Hunt Like Never Before! This easy-to-plan, easy-to-pull-off scavenger hunt guides families through the truths in Romans. This isn’t your typical family Bible study—invite the kids in your community and their grown-ups to explore the book of Romans and find good news about God’s amazing love. This event is designed to bring families together for fun and spiritual growth. Get ready to journey through the book of Romans like never before! This family event works great anywhere. Here are options to consider. Multi-Purpose Room Set up stations in a large, multi-purpose space. This space will be buzzing with activity, so it might get a little loud. Classrooms For a more mysterious feel, set up stations in a series of rooms. This setup makes it easier to hear and focus on station leaders, and families will be surprised by each new experience. Outdoors Use pop-up canopy tents to create each unique station area. Keep in mind, though, that weather may force a change in plans. Whatever format you choose, set up signage for each station. Use poster board to make large signs with station names surrounded by several sample collectibles. Who read the letter first? Use book introductions in a children’s Bible to research fun facts, then post findings throughout your event space. Enlist friendly welcome greeters who’ll explain the challenge of this scavenger hunt: Visit all six unique stations and gather all six different collectibles along the way. They’ll show families the Clue Board—a 3D poster that reveals the collectibles kids get at each station. in any order, but when they’re done, the collectibles will help them remember and retell their discoveries. Before releasing families to their scavenger hunt, give each person an envelope to store their findings. Print the checklist on Avery Address Labels (3-1/3” x 4”) and place them on the outside of 6 x 9 envelopes. This checklist will help families know what to look for, and it’ll help them re-tell the good news at home. Kids reach for measuring tape. Ahead of time, tape the measuring tape pieces to long pieces of fishing line, or attach them to the line with small clothespins. String the fishing line high above and across the length of your space so it almost touches the ceiling. Have families read Romans 3:23 together. Say: Measuring tape gives us a standard to measure things by. Let’s measure ourselves now. Can you reach the measuring tape? Make it a game; encourage kids and families as they reach unsuccessfully for a piece of measuring tape. (If the adults are really tall, have them reach while on their knees.) Then encourage kids to jump, stand on tiptoes, and find other ways to try to reach the measuring tape. When have you been too short to do something? How is that like not measuring up to God’s awesomeness? Have kids tuck their measuring tape into their envelopes, and remind them to check it off their list. 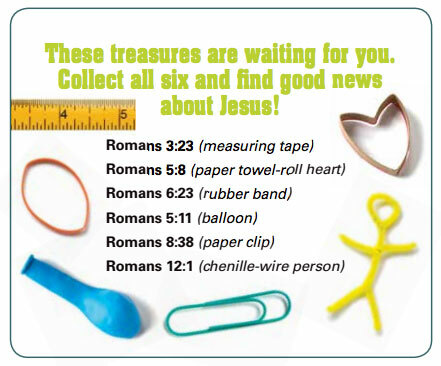 Say: This measuring tape reminds us that, on our own, we can’t measure up to God’s awesomeness. But there’s good news—Jesus will help us. Keep talking. Families can visit stations in any order, so expect kids and grown-ups to come and go throughout the event. Repeat questions and refresh the conversation as families arrive. Come prepared. Have extra supplies on hand. Bibles. Mark your station’s verse from Romans with a bookmark to help families find it. Keep collectibles up high. Kids will be itching to get their hands on the trinket that goes along with your station, but wait to give it to kids until the end of the experience to avoid distractions. Turn empty paper towel rolls into heart stamps. Ahead of time, cut 5 paper towel rolls into quarters. Bend and crease the side of rolls to make a heart shape. Cut the rest of the paper towel rolls into 1⁄4-inch pieces for take-home collectibles. Set out paint on small plates and card stock. Next, have families Romans 5:8 together. Then hold up a paper towel roll. Say: This looks just like a toilet paper roll, doesn’t it? Those are pretty gross—they hang out near the germiest part of our house! Sin makes us gross, too. But God doesn’t throw us away. When Jesus died for us, he cleaned away our sin. His love made it so we can be friends with God—isn’t that beautiful? Let’s use these paper towel rolls to make something beautiful. Have each person press one end of the heart stamps into the ink pad, then stamp hearts on the cardstock in the shape of a cross. Invite families to use markers to write “God loves (their name)” on the paper. How does it help you to know that God loves us at our worst? What does this verse tell you about God? Give guests each a paper roll heart and remind them to check it off their list. Say: This heart was once like a toilet paper roll. It reminds us that, even though we were messy with sin, Jesus died for us. Turn string into a never-ending path. and five 20-foot pieces of yarn. Have families read Romans 6:34 together. Give each family a piece of string. Have them use it to make a creative path on the ground, then have them walk on it together. What do you notice about your path? Point out all paths that have a beginning and an end, and then invite families to make creative paths that never end. (The two ends must come together.) Then have families walk their unending paths. Say: Jesus beat death when he came back to life, and he gives us forever life with God. When we believe in Jesus, we’re friends with God, and we’ll be friends with God forever in heaven. What’s great about being friends with God here on earth? How does the verse comfort you when you think about forever? Before they leave, give guests each a rubber band and remind them to check it off their list. Say: This rubber band is a circle. It reminds us that God gives us never-ending life. Deflate a balloon and bring stickers together. and 10 small stickers per family. Make a sample to show families: Inflate a balloon and place at least 10 stickers in a vertical line from the bottom to the top of the balloon. Make sure stickers are about one inch apart. Have families read Romans 5:11 together. Have each family inflate a balloon without tying off the end. Then have one family member hold it closed while others attach stickers in a line, about one inch apart on the balloon, like your sample. Encourage kids to press the stickers firmly so they’re tight on the balloon. when he died for us. Let go of your balloons and see what happens to the stickers. Have families let go of their balloons and then look at the stickers. Say: The air inside the balloons kept the stickers apart, but now the stickers are close together. Like we took the air out of the balloon, Jesus took our sin away so we could be friends with God. What makes someone a close friend? In your experience, how does sin separate you from God? Give guests each a balloon and remind them to check it off their list. Say: This balloon reminds us that now we’re God’s friends. That’s good news! Use magnets to make paperclips rise off a table. and 20 10-inch pieces of string. Ahead of time, tie a piece of string around each paper clip and tape the other end to the tabletop. Spread out and attach the paper clips securely all over the top of the table. Have families read Romans 8:38 together. Say: It’s hard to separate strong magnets. They don’t want to come apart. Give each family two strong magnets. Have grown-ups guide kids to explore the strength of the magnets by putting them together and taking them apart. Say: Magnets remind us of God’s love. Nothing can separate us from God’s love. No matter what we do, God wants to draw us close to him. Show families how to hold magnets above one of the paper clips on the table. Use your other hand to lift the paper clip to the magnet so it connects. Slowly lift the magnet higher so it’s no longer touching the paper clip, but the paperclip remains attracted to the magnet in the air. Allow time for families to play with the magnets and paper clips. What other things are hard to separate? How does it help you to know that nothing can separate us from God’s love? Give guests each a paper clip and remind them to check it off their list. Say: This paper clip reminds us that nothing can separate us from God’s love. Create family murals on a wall. and one chenille wire per person. Ahead of time, cover at least two walls completely with craft paper. Place crayons near the walls. Cut chenille wires in half, then cut one half into two equal parts again. Twist the larger pieces into circles (heads) and bodies, then twist the smaller pieces onto the bigger ones to make legs and arms. Make one per person. Have families read Romans 12:1 together. Say: God’s given us so much. His love, his Son, Jesus, and his friendship, just to name a few things. One way we can say “thank you” is to give our bodies to him. Show family members how to stand and pose in front of the wall while another family member traces their bodies with crayons. Encourage families to be creative and have fun as they pose to make a family mural on the wall. Place stools nearby so kids can reach around the grownups’ heads. After everyone’s body is outlined, invite families to color the inside, giving each other clothes and faces. Have families write or draw ways they can honor God with various body parts. For example, they might write “Hug!” on arms, or “Go to church,” on feet or “Tell someone ‘God loves you’ ” on mouths. What’s the coolest thing you’ve learned or noticed about your body? Why do you think God wants our bodies? Give guests each a pipe cleaner person and remind them to check it off their list. Say: This little body reminds us that we can say, “Thank you, God!” with our bodies and share the good news of Jesus with others. Charity Kauffman is a managing editor in Group’s children’s ministry department and a former children’s ministry director.